A self-confessed guitar “lowbie” like me would always get bored after a round of guitar lesson. And even in today’s digital age, these supposedly called guitar apps that would help you treat boredom while learning few basic strums couldn’t pull it off. Not until I found Jamstar. This puppy from LiveTune Ltd. is the holy grail for frustrated guitar masters. 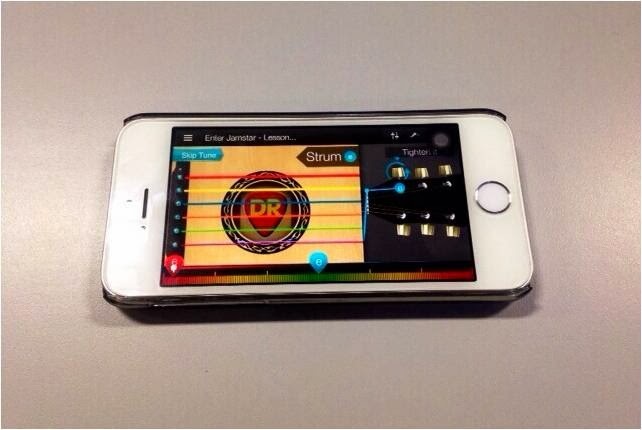 Learning guitar with Jamstar is pretty simple – digitally tune your guitar, play some notes and be a rockstar! This app basically senses your strums with its “polyphonic algorithms” and tells you if your key is off...and you have to do it again. But this time, the app itself will guide you along the process. It listens when you play and judge your guitar skills by sending you off to the next level or making you repeat infinitesimally. The best thing about this guitar app is that it’s a heck of a natural teacher. It is absolutely more complex than any other guitar apps you’ve tried. And when I say “natural,” I meant that you’ll obviously get the skill even without the app dictating you what to do. You’ll also get brand new tunes out of the box. Of course, most of them require in-app purchases. You’ll have a breeze while navigating through the app. Once you pull it off, it offers you with various sign-in options. I did the Facebook sign-in because I wasn’t that zealous to type in another email address. However, the app itself is a jewel – simple yet stunning. I tried it over an iPhone and I’m still rocking it as we speak. I have nothing to say against the app - just a few more additional song selections won’t hurt though. You can get it in App Store, Google Play or play free in the web.